Q: What’s the best way to manage differences in PGR response? A: There can be differences in PGR response from spring to summer and across different course areas, including greens, collars and fairways. If you’re too late, the plant can rebound and grow faster than normal. If you’re early, you can over-suppress and lose turf quality. When applying a PGR, instead of just applying “every 14 days,” for example, use a PGR with a Growing Degree Day (GDD) model, such as Anuew™. This is a more accurate way to make application timing decisions based on temperature and plant metabolism. The hotter it gets, the faster turfgrass metabolizes PGRs. This varies by the height of turfgrass areas as well. Greens will need reapplication before fairways. Use the GreenKeeper APP (or similar) that will calculate GDD for you. Q: How do I manage collar decline when using a PGR? A: There’s been a lot of research about how to best manage collar decline. General findings are to observe specified application rates for each course area and understand the GDD difference between short- and tall-cut grasses. With this in mind, avoid spraying greens, collars and fairways at the same intervals. Because of the collar proximity to the green and fairway, it may be best to spray the collar every other application period. Q: Can POA in mixed stands be more evenly regulated? A: Anuew PGR works differently to support more even regulation of Poa in mixed stands. For example, Poa and bentgrass release at about 260 to 280 GDD with Anuew so superintendents can experience more balanced regulation. 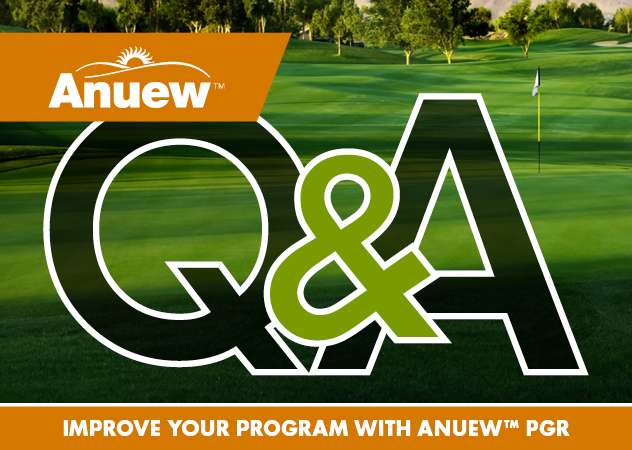 Additionally, because Anuew is more active on Poa and provides the benefit of fast regulation it can be used as a companion in warm-season turf regulation programs.